One is, the 1 degree weekly OI is not his latest/greatest analysis system. It is a legacy system, run only for the use of the CPC (climate prediction center). For a decade or more, he (and collaborators, now Viva Banzon and collaborators) have done a 0.25 degree, daily analysis (still using OI methods), with retrospective run back to September, 1981 -- when the AVHRR was first launched. See http://www.ncdc.noaa.gov/sst/ for data. The weekly OISST was developed when ships were the main source of in situ observations, and there is no ship-buoy SST adjustment in it. On the other hand, the latter daily OISST was developed when more buoy data became available, and there is a ship-buoy SST adjustment in it, as in the latest version of ERSST. Solar forcing, which adds to surface temperature, was less. The sun hasn't been putting out quite as much energy in recent years. Volcanic forcing, which dampens temperature, was greater. Both these acting together meant that the CMIP5 models were running hotter for most of the time from 2006 onwards. First, here is an annually averaged global sea surface temperature chart using the high resolution data as well as the older Reynolds OI v2. The shaded area covers the period when the forcings were from estimates, not from observations. 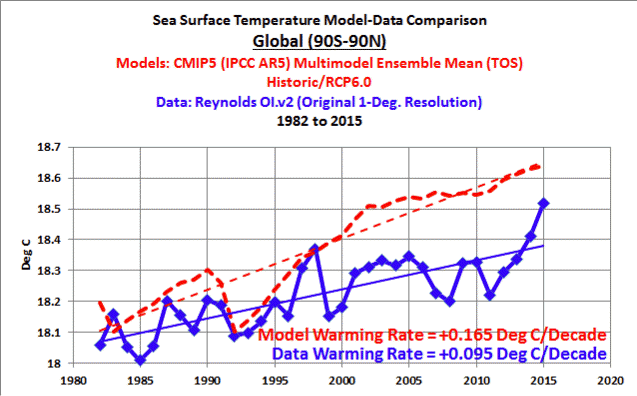 You'll notice that the sea surface temperature was below the model mean for much of that time, but is above it now in the high resolution version. The next chart includes data that Bob decided to ignore. It's comparing ERSSTv4 and HadSST1 with CMIP5 for RCP8.5. 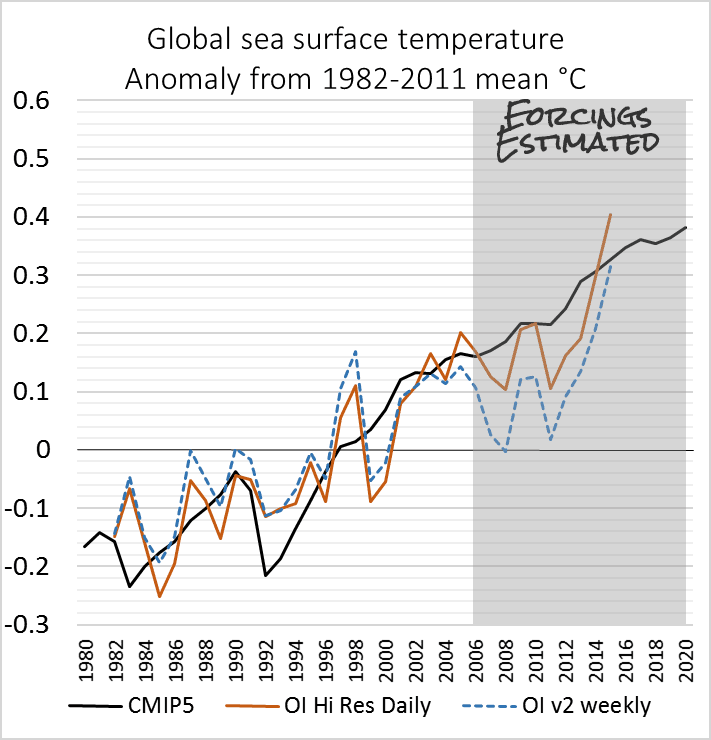 The above chart is messy in the early years, before the twentieth century, when observations of sea surface temperature were very sparse so uncertainty is high. Because of that, and because of data problems in the 1940s, I've also plotted the same data but just from 1951 onwards, as shown below. What you'll probably notice is the difference between HadSST and ERSST. 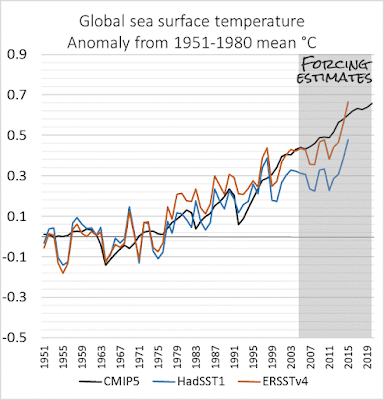 From around 1979 through to the mid 1990s, ERSST shows higher temperatures than HadSST. And again for most of this century, ERSST is much closer to the CMIP5 projections than HadSST is. So for all you avid WUWT readers who wondered how the models and different data sets of observations stack up from a global perspective, now you know. And you also know that even though the models have been running hotter than they would have if the forcings hadn't been over-estimated from 2006 onwards, the observations have now mostly risen above the model projections. There's more. In their recent paper in Nature's Scientific Reports, Michael Mann, Stefan Rahmstorf and co plotted CMIP5, adjusted to take account of the observed forcings. 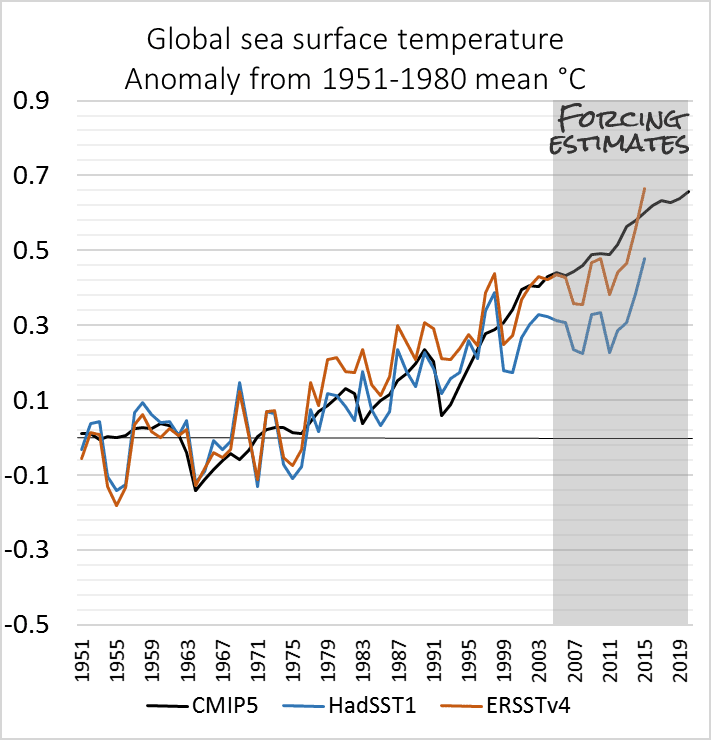 Stefan Rahmstorf has now updated the chart with 2015 GISTemp data. Here is the latest chart. This is of land and sea surface temperature, unlike the ones above. As you can see, the observations are very close to the multi-model mean projection. 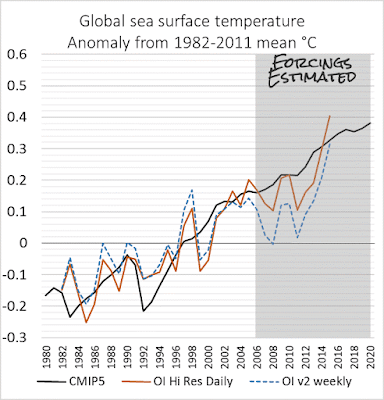 Figure 5 | Global mean surface temperature and CMIP5. 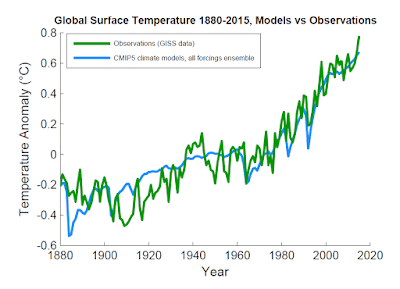 The CMIP5 multi-model mean has been updated with recent forcings and GISTemp data includes 2015 observations. Source: Stefan Rahmstorf, updated from Mann15 article in Nature's Scientific Reports. One of the differences between his graph and yours is that he is showing absolute temperatures while you are showing anomalies. It looks like the baseline temperature for the two data sets is different, and so the observed temperature is lower relative to the modeled temperature in his graphs than in yours. I assume that using absolute temps rather than anomalies was a deliberate choice on his part for precisely this reason. I live in Texas so I’m in the minority who accept climate change. I have a very difficult time finding climate models that I can compare with actual temperature reported each month. Figure 5 looks great but the first question I will be asked is “What is the CMIP5 climate models, all forcings ensemble”. I understand CMIP5 has several different scenarios and I don’t know if figure 5 shows an average of all those scenarios or what. Is there a place on the web where I can see the different scenarios along with the actual temperatures and maybe even projections? 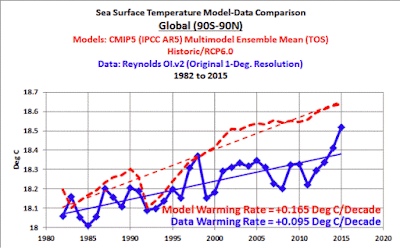 And are the CMIP5 models considered the standards for climate models? Here and in subsequent figures, model hemispheric and global mean surface temperatures are based on a combination (“TAS/TOS”) of surface air temperature (“TAS”) over land and sea surface temperature (“TOS”) over ocean. Here and elsewhere in the article, temperatures are defined as anomalies relative to the the long-term (1880-2014) mean. The different emissions pathways wouldn't have started to diverge yet, though they will soon. I wouldn't try to compare multi-model means on monthly charts, in part because of the averaging (multi-model) and in part because CMIP models are for long term, not monthly projections.